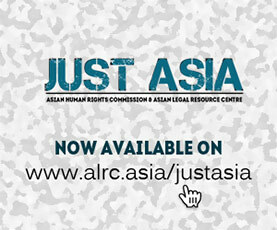 The Asian Human Rights Commission (AHRC) wishes to forward an appeal from Thai Lawyers for Human Rights (TLHR). 109 Soi Sitthichon Suthisarnwinichai Rd. Ms. Sirikan Charoensiri, ‘June’, is a human rights lawyer working for Thai Lawyers for Human Rights (TLHR) as a legal and documentation specialist. On 3 November 2016, she reported to the Dusit District Prosecutor’s Ofﬁce in Bangkok to hear the prosecution’s orders of her offences. They are refusing to comply with an order of a competent ofﬁcer and concealing evidence. She was charged under Sections 142 and 368 of the Thai Criminal Code. The prosecutor, having received additional information from the investigation of witnesses and evidence from the police, decided to postpone the meeting for the fourth time. Ms. Charoensiri will report to the public prosecutor to hear the prosecution’s orders at 9.30 am on 17 January 2017 at the Department of Summary Litigation 3 (Dusit) in Bangkok. According to the prosecutor, the police had ﬁnished the additional investigation of two witnesses and returned the case ﬁle to the ofﬁce. Earlier, the prosecutor had ordered the police to call additional witnesses for investigation and submit the case ﬁle by 31 August 2016. It was later postponed to 30 September. Ms. Charoensiri had previously listed ﬁve witnesses: two members of the New Democracy Movement (NDM)—her clients, Ms. Yaowalak Anuphan—Head of the TLHR, an inquiry ofﬁcer who received Charoensiri’s complaint of malfeasance in ofﬁce, and herself. However, only two NDM activists, Mr. Rangsiman Rome and Ms. Chonthicha Jaengrew, were called. Having received further information on the case, the prosecutor stated he needed more time for consideration, and rescheduled a meeting at the Dusit District Prosecutor’s Ofﬁce in Bangkok. Note that this is the fourth postponement of Ms. Charoensiri’s hearing of prosecution orders in this case. The ﬁrst hearing was set for 12 May 2016. It was rescheduled for 27 July 2016. Later, the meeting was postponed to 29 September 2016. Today, November 3, 2016 it was postponed again to 17 January 2017. This case has been under the public prosecutor’s consideration for more than six months.